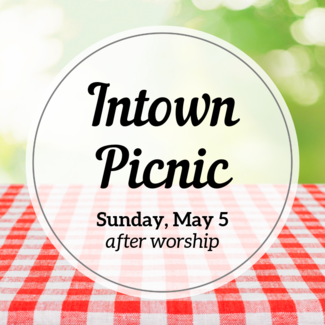 Please join us for a Church-wide Cookout Picnic on the back lawn right after morning worship on Sunday, May 5. Come for some great fellowship for the entire congregation, good food (provided by Intown), and lovely spring weather! Please sign up here so we can plan enough food, and to volunteer for helping with set-up/clean up and greeting. Grillers (6) - Arrive 11 am. Help grill the food. Greeters (10) - Arrive at 12 pm. Greet people as they arrive and direct people to food line. Servers (10) - Arrive at 12 pm. Help with the serving line of food.